While apple picking the other day, we discovered an intriguing new-to-me squash. It looked like a blue-gray pumpkin. Feeling adventurous, we got a small one to try out. And despite the heat, I whipped up this creamy soup for dinner. This is a really easy way to make a soup. Everything gets roasted together on a pan and then dumped into your soup pot with some broth. I used an immersion blender to get it creamy, but you could also easily use a food processor before putting the soup in the pot to heat up. This is also easy to do in parts. If you have a lot of time over the weekend to let something roast, then you can just blend it together and heat it up during the week when you’re ready for your soup! I loved this cooking method. It was so convenient to just toss everything in the oven and be able to do other things while everything’s cooking. The squash I used is called Queensland Blue. Since this squash is rather pumpkin-like, I wasn’t about to attempt peeling it. I cut it in half, scooped out the seeds, seasoned the inside, then placed cut side down on the pan to roast. When it’s fork tender, just let it cool and scoop out the insides. It’s not as sweet as a butternut squash and has a horribly hard center that made it challenging to get the seeds out. 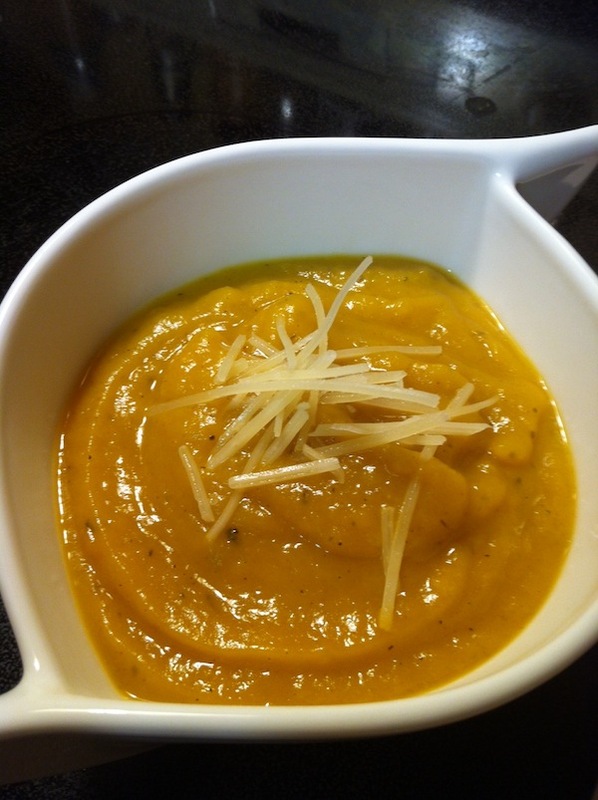 Because it wasn’t a very sweet squash I was a little disappointed with how this soup turned out. I think it needed a little extra sweet, so I’d recommend using butternut squash or adding in a roasted sweet potato or two, or using sweet apples (I used Empire). But despite being a little too tart in my opinion, this soup does have a lot of depth of flavor from the combination of squash and apple, thyme and rosemary. It’s definitely a taste of fall. 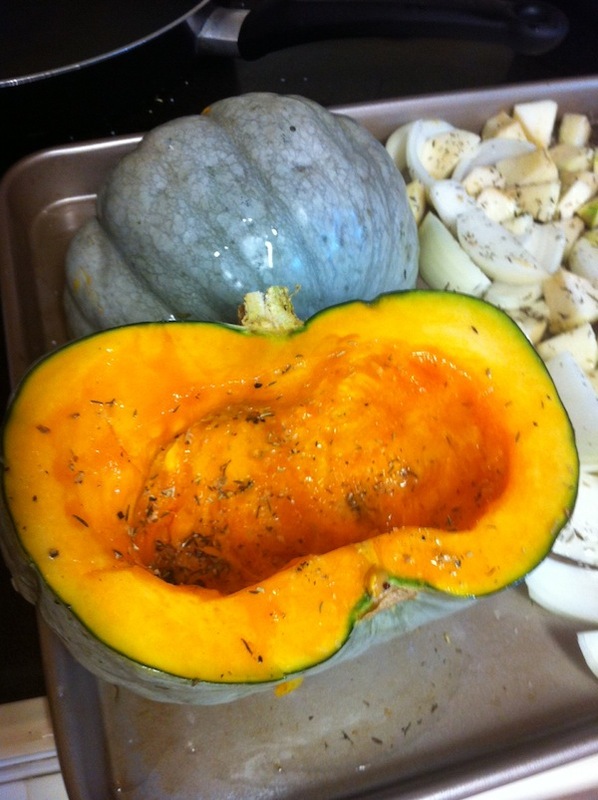 On a large roasting pan, toss squash, apples, onion, and garlic with olive oil, salt, rosemary, thyme, and allspice. Roast for about 40 minutes, turning halfway through. Puree the roasted vegetables/apples with the vegetable broth (either in batches in a food processor/blender, or in the pot with an immersion blender). Pour pureed soup into a large pot and bring to a simmer until warmed through. Taste and adjust seasoning as needed. Top with grated parmesan cheese if desired. Life in Balance: What’s the deal with the “Dirty Dozen”?